You can see the stitching on his jersey. Rivulets of sweat running down his neck. Zoom in a bit more, and it's even possible to make out the glimmering reflection in Michael Vick's digital eyes. In terms of lifelike, photo-realistic detail, the newest version of Madden football, "Madden NFL 06," -- released today along with Microsoft's uber-powerful XBox 360 console -- trounces every pigskin video game to come before it, like the Indianapolis Colts running roughshod over the hapless Houston Texans. 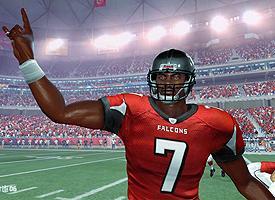 If only Michael Vick played like his Madden mirror image in real life. So why does the virtual Vick seem so off? Maybe it's his stilted throwing motion. Perhaps it's the awkward way his lips move when calling audibles. Either way, I feel like an ingrate. A decade ago, football games didn't have players with faces, let alone moving lips. The first time I saw the "Madden 92" ambulance roll onto the field to pick up the fuzzy blob of pixels that was my injured quarterback -- running over a half-dozen other players en route, of course -- I nearly wet myself in quivering awe. OMG! It doesn't get any more true to the actual NFL! That was then. Today, there's something about the new, vastly improved Vick that leaves me cold. Unsatisfied. Drives me nuts, really. And it's the same general principle that explains why, as a sports fan, the only thing worse than rooting for a lousy team is pulling for a good team that isn't quite good enough. What, you thought all that Boston Red Sox garment-tearing and teeth-gnashing was just over a stupid curse? First, my Vick problem. Computer animators have a term for it: the Uncanny Valley. First conceived by a Japanese roboticist in the 1970s, the Uncanny Valley deals with our emotional responses to nonhuman entities, such as a robot or Madden's computer-generated Vick. Put simply, the theory states that as a nonhuman entity becomes more like us in its appearance and motion, our reactions become increasingly positive and empathetic -- until it becomes "almost human," at which point our feelings give way to revulsion. Why do we get creeped out? Easy. So long as an entity is sufficiently nonhuman -- think C-3P0, or the crude players in earlier Madden games -- we tend to notice its human qualities. An effeminate English accent stands out; a blurry touchdown dance delights us. But when that same entity gets close to seeming human, the opposite effect takes place. Every flaw becomes huge, every nonhuman quality impossible to ignore. The old Madden players were charmingly unsophisticated. The newest digital Vick brings to mind one of George Romero's zombies, only without the blood and bad teeth. In other words, expectations influence reactions, and often in a negative, counterintuitive way. The more you have, the more you notice what you lack; the closer you are to perfect, the less you overlook minor imperfections. Easy enjoyment gives way to perpetual dissatisfaction. Anyone in sports knows this feeling well. Too well, in fact. Take the real-life Vick. When he first entered the professional ranks, everything was grand: We marveled at his singular athletic ability, oohed and ahhed as he produced highlight after highlight. Was he a Dan Marino-like dropback passer? Nope. Didn't matter. Vick was ludicrously fun to watch, and we accepted him as such, taking pleasure in every improbable slalom through a half-dozen bewildered defenders. In 2003, Vick led Atlanta to a playoff upset of the Green Bay Packers. At Lambeau Field. In the snow. Beating Brett Favre in the process. It was the biggest win of Vick's career -- and, quite possibly, the worst thing that ever happened to him. Suddenly, Vick was more than an athletic curio. He became a guy who could win a Super Bowl. Not someday. Right now. Our perception shifted. So did our demands. We stopped breaking down Vick's shifty runs, started picking apart his completion percentage. When is he gonna master the West Coast offense? Never mind that Vick wins games with more than his arm, or that the similarly-gifted Steve Young also took time to develop; the Falcons quarterback now resides in pocket passing's Uncanny Valley. As such, is it any wonder that Vick sounded genuinely frustrated -- almost betrayed -- when he recently fired back at his critics? To put things another way: was it simply an 86-year title drought that made Red Sox Nation the most nitpicky, angst-ridden, manic-depressive fan base in baseball? Or was it the soul-sucking trauma of being good enough to win it all, but not quite good enough to get past the hated New York Yankees? Hint: Chicago Cubs and White Sox fans don't have the equivalent of a Sons of Sam Horn message board. Year after miserable year, Red Sox fans were in the Uncanny Valley of heightened expectations. I can relate. Full disclosure: I'm an ardent fan of the University of Arizona men's basketball team. I grew up near the campus. My father teaches at the school. Over the last 15 years, I've seen just about every game they've played. My favorite seasons? The ones that ended with Final Four appearances. My least favorite seasons? Everything else. Under Lute Olson, the Wildcats have become consistent championship contenders, so much so that I've become a spoiled, insufferable crank. I take victories for granted; I dwell on every upset loss. I yell at the screen, toss the remote, pick apart college kids who are barely old enough to vote. And that's when Arizona is winning. My wife wonders why I seem to take bad shots and errant passes so personally. I don't think she gets it. Is flawless execution really too much to ask for? The Uncanny Valley can be an unhappy place. Ask any fantasy football player: when your team seems this close to ideal, the smallest weaknesses will drive you batty. Make you lose sleep. Cause you to ponder foolish deals. Shaun Alexander for Neil Rackers? Well, I could use a better kicker . . . Crazy enough, the same goes for the actual NFL. Consider the Philadelphia Eagles. They had a good thing going: three consecutive NFC title games, star quarterback, killer defense, harmonious locker room, salary cap sanity. Then they signed Terrell Owens. You might have heard about the rest. Why take a chance on the league's top malcontent? The Eagles were in an Uncanny Valley of sorts, a game-breaker away from the Super Bowl. They wanted out. When you're 4-12, Owens is a headache; when you're 12-4, those four losses are a headache. And Owens looks like potential aspirin. Again, expectations color perception -- and with it, satisfaction. In his book "The Progress Paradox: How Life Gets Better While People Feel Worse," former Page 2 contributor Gregg Easterbrook notes that while average incomes have doubled in the past 50 years, the percentage of Americans who describe themselves as "happy" remains constant. What gives? Part of the problem, Easterbrook suggests, lies with our heightened sense of entitlement, with our penchant for dwelling on minor ills while ignoring larger goods. Such is the essence of the Uncanny Valley, and perhaps of most sports nostalgia, too. Think about it: the Good Old Days weren't really that good -- not when African Americans weren't allowed on the same fields as whites, when baseball players were basically indentured servants, when NBA players wore shorts that more or less resembled hot pants. Nevertheless, we cling to the past. Treasure it. Pay big bucks for keepsakes, home run balls and seats from demolished stadiums. Logically, this fails to compute. A stately pleasure dome such as Comerica Park is undeniably nicer than crummy old Tiger Stadium. Yet seen through the prism of the Uncanny Valley, our rose-tinted rearview mirror makes sense: as youngsters, we lack the critical frame of reference that experience provides. We enjoy things for what they are. We don't know any better. We like robots who seem human. Who wouldn't want to recapture that feeling? In the old Sega Genesis basketball video game "Lakers Vs. Celtics," Tom Chambers -- well, the pixel blob that passed for Chambers -- could double-pump dunk from the 3-point line. As a boy, I didn't view this as dubious; I was too busy trying to pull it off against the CPU. No longer. I see today's hyper-realistic basketball games -- complete with players who appear to chew gum -- and can't understand why the players' shoelaces don't flop. Or why their tattoos look slightly blurry. No wonder, then, that some people still play the original "Tecmo Super Bowl". No wonder part of me wants to join them. When a player such as Vick gets hurt in the new Madden, he actually grabs the appropriate part of his digital body, wincing in virtual pain. It's an impressive show -- yet somehow less compelling than a poorly-animated ambulance graphic plowing through a half-dozen players to get to an injured QB No. 7. Sometimes, you don't know what you have until it's been replaced by something better. Patrick Hruby is a Page 2 columnist.